12 DAYS TO CHRISTMAS GIVEAWAY RULES: KNDI Radio’s 12 Days to Christmas Giveaway will begin on Monday, December 10, 2018 and end on Friday, December 21, 2018. Each day will have a certain number of prizes. The first day will be the 12th Day to Christmas (12/10) and KNDI Radio will give-away 12 sponsored prizes throughout the day. 11th Day to Christmas will have 11 prizes (12/11), until we get to the 1st Day to Christmas on Friday, December 21, 2018 where we will give out just 1 prize. 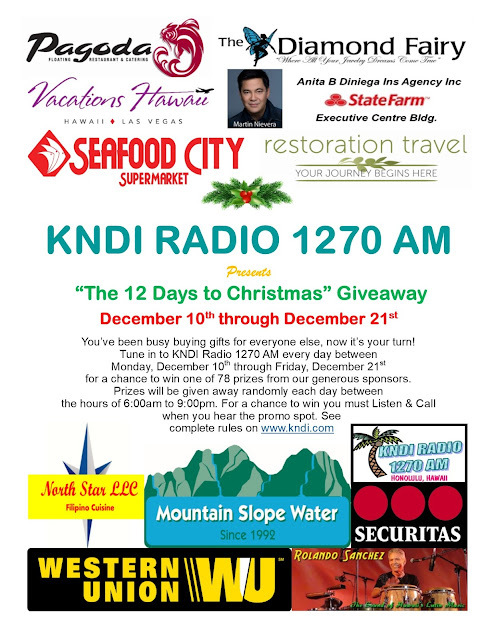 KNDI Radio’s 12 Days to Christmas will have a total of 78 prizes. Sponsored Prizes will be announced on the day of the giveaway. You must listen for a special promo that tells you when to call the studio. The deejay will also announce when the contest has begun and what caller he/or she is looking for. Only call the numbers 946-2845 or 946-2846 as any other number will delay your chances of winning. And only once (1x) during the week of December 16th through December 21st. If winner is disqualified for any reason, we will randomly giveaway prizes before December 31, 2018 on KNDI Radio. ELIGIBILITY: Contest is only open to residents of Hawaii and winners must be 21 years or older. Government Valid ID, address and phone number is required for prize pickup and must match winner’s name. All prize winners will be live via telephone on-air. Do not give any information other than your name while live on-air, deejay will ask you to stay on the phone until he/or she has taken you off-air to get your information. 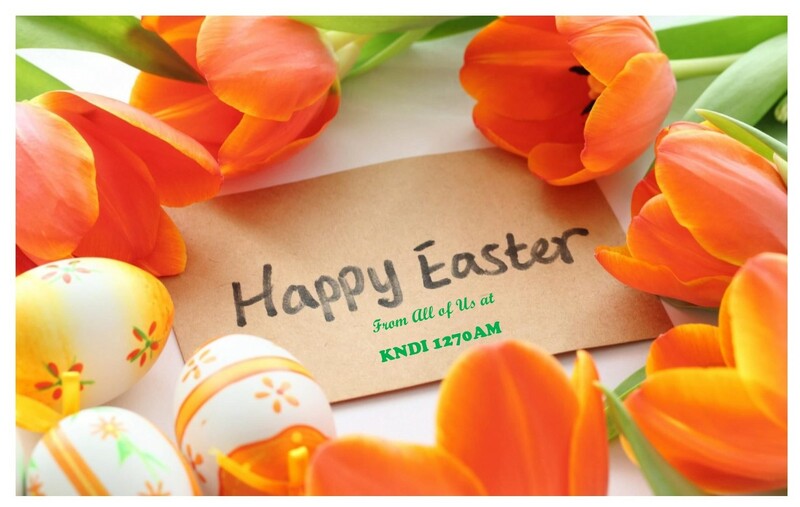 KNDI Radio 1270AM may record and/or broadcast, in any way, a Participant’s name, voice and the substance of all or any portion of the call. Participant acknowledges that such recording and use may occur and grants KNDI Radio permission to record and use such recording without any additional communication or compensation to Participant. Prize Sponsors and their employees, KNDI Radio Employees, KNDI Radio Program Hosts, Program affiliates and any immediate household members are not eligible to win any prizes in the “12 Days to Christmas” Giveaway. Participation in contest will end in disqualification. 5. Contest winners are required to pick up prizes by deadline date of 12/26/18, all prizes not picked up will be given away in a 2nd Chance Giveaway before 12/31/18. WARRANTIES AND REPRESENTATIONS: By entering and participating in the Contest, and in consideration thereof, each Participant individually warrants and represents to Sponsors that they: (1)meet the residency and age requirements at the time of winning; (2) will be bound by these Rules, and by all applicable laws and regulations, and the decisions of the Sponsors; and (3) waive any right to claim ambiguity with respect to these Rules; (4) they are the sole creator and owner of Submission; and (5) the Submission or any use thereof, shall not violate any law and shall not infringe upon or violate the rights of any person (including, without limitation, contractual rights, copyrights, trademarks, rights of publicity and rights of privacy). Sponsor’s acceptance and/or utilization of the Submission hereunder shall not constitute a waiver of Participant’s representations, warranties or agreements in respect thereof, or a waiver of any of Sponsor’s rights or remedies. RELEASE OF LIABILITY AND INDEMNIFICATION: The Participant prize-winner is solely responsible for determining and paying all federal, state and local taxes (including any sales taxes). Any person winning over $600 in prizes during a one-year period will receive an IRS Form 1099 at the end of the calendar year, and a copy of such form will be filed with the IRS. WINNER SELECTION: Prize winners will be selected randomly by the deejay announcing on-air: the caller number that will become the winner via telephone after the promo spot airs saying its time to call. By participation, the Winner agrees to allow KNDI to broadcast telephone call live on-air; however, KNDI will ask contestant/winner to be placed on hold to get their information off-air. Participants are not to give any sensitive personal information while on-air. Winner must have a Valid ID, be a Hawaii Resident, 21 years and older and have social security number if necessary. If winner cannot pick up prize during the hours stated, winner must call 946-2844 and speak with Ellen to arrange a pick-up time before December 26, 2018. Prerequisites to Prize Awarded: Prior to being awarded a prize, winners are required to provide (1) a valid government-issued photo identification depicting proof of age and (2) a valid taxpayer identification number or social security number. The social security number will be used for tax-reporting purposes on prizes larger than $600.00 in value. KNDI reserves the right to deny awarding the prize if the winner fails to provide satisfactory identification, as determined in KNDI Radio sole discretion. reserves the right, in its sole discretion, to award unclaimed prizes to alternate contestants or not to award the unclaimed prizes. PUBLICITY RELEASE: Unless prohibited by applicable law, Participant authorizes and irrevocably grants to KNDI Radio and Prize Sponsors of this contest permission to, from time to time, reference and discuss Participant and their participation in the Contest on-air and/or on their website(s), social media, photographs, video recordings, digital images, audio recordings, as well as in publications, newsletters, news releases, other printed materials, and in materials made available on the Internet or in other media now known or hereafter developed for any purpose KNDI Radio and/or the Prize Sponsors deem proper. Such reference and discussion may involve Participant’s name and voice, and other personal/biographical material or their participation on-air. LICENSE: By participating in Contest, Participant irrevocably grants KNDI Radio the perpetual right, without any liability to any person or entity, to reproduce, adapt, transmit, distribute, communicate, make available and otherwise use any Submission throughout the universe in any medium and in any manner, now or hereafter known, including without limitation, if applicable, radio and television broadcasts, and cable and satellite transmissions, without payment of any compensation to Participants in connection with any Contest. DISQUALIFICATION: All participants agree to be bound by these General Rules. Non-compliance with any of the General Rules will result in disqualification and all privileges as Participant will be immediately terminated. KNDI Radio, in its sole discretion, further reserves the right to disqualify any person for: (1) obtaining winner status using false, fraudulent or deceptive means; or (2) engaging in otherwise unsportsmanlike, disruptive, annoying, harassing, or threatening behavior. Each person may only win once (1x) during the period of December 10th through December 15th and only once (1x) during the week of December 16th through December 21st. If KNDI Radio finds that a Participant has already won during the weeks stated above, Participant will be disqualified, and prize will not be awarded to Participant. CAUTION: ANY ATTEMPT BY ANY PARTICIPANT OR ANY OTHER INDIVIDUAL TO DELIBERATELY CIRCUMVENT, DISRUPT OR DAMAGE ORDINARY AND NORMAL OPERATION OF ANY CONTEST, TELEPHONE SYSTEMS OR WEB SITE, OR UNDERMINE THE LEGITIMATE OPERATION OF ANY CONTEST IS A VIOLATION OF CRIMINAL AND CIVIL LAWS. SHOULD SUCH AN ATTEMPT BE MADE, KNDI RADIO RESERVE THE RIGHT TO SEEK DAMAGES FROM ANY SUCH INDIVIDUAL TO THE FULLEST EXTENT PERMITTED BY LAW. RULES CHANGES AND INTERPRETATIONS: KNDI Radio reserves the right in its sole discretion to supplement or make changes to these General Rules as well as the rules of any contest at any time without notice. KNDI Radio reserves the right in its sole discretion to interpret the rules of any contest, and such interpretation shall be binding upon all participants. 5) If for any reason a claim or dispute regarding the Contest or these Official Rules proceeds in court rather than through arbitration, there will not be a jury trial. “12 Days to Christmas” Giveaway winners will be listed also on the website after contest has ended and all prizes have been awarded. Geronimo Broadcasting Inc. owns and operates KNDI Radio under its license through the FCC and will not be held liable for any loss or damages to prizes once they are claimed. Geronimo Broadcasting Inc., owners and employees are not responsible for taxes, fees and any other requirements associate with prize. The sole responsibility is with the Participant who won the prize.